Born in 1989 by Carry Cohen and Richard Timbo, Luminox watches have become one of the most sophisticated, bold and innovative fashion statements of today. Sporting a Swiss-made design featuring their unique self-powered illumination system, Luminox watches have created a more visible and easier to read watch face in low- or no-light situations across all of their watch lines. Without the push of a button or exposing your timepiece to a light, the time is continuously visible and illuminated for up to 25yrs. This proprietary technology is why the United States Navy SEALs can rely on Luminox watches for accurate and clear time no matter the situation or conditions whether it's through Luminox's Land, Air or Sea line. The Luminox Land watch line consists of many models created for, and supplied to, professionals around the world in military, law enforcement, SWAT teams, border patrols, and more. Luminox understands the importance of time in these precarious situations and has designed their Land collection to be as ready as you are on foot and out on the field. Their Sea collection has become a consistent and dependable go-to a professional diving watch. The uncertainty of one’s life in diving scenarios relies on accurate time, be it during night diving, deep diving excursions, diving in murky waters, or wreck diving. Luminox's own Light Technology (LLT) guarantees that all its watches have easy and immediate readability out in the deepest waters. In conjunction with Lockheed Martin, the world’s largest defense contractor, Luminox Watches' Air collection has produced some of the world's most precise watches, which were initially developed for US Air Force pilots flying the F-117 Nighthawk Stealth jets. When precise time is a main priority, Luminox is the name that stands true. 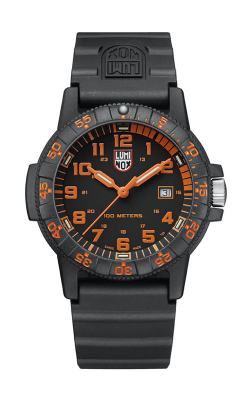 Why Shop for Luminox Watches at BARONS Jewelers? At BARONS Jewelry in Dublin, California, you can rest assured you will receive quality service when inquiring about Luminox watches and more. The family-owned and operated jeweler boasts one of the largest inventories of luxury jewelry items in the local San Francisco, Pleasanton, and Bay area. With the exclusivity of being one of the only Tacori Diamond Retailer on the entire West Coast, you know that BARONS is a one-of-a-kind jeweler that is ready to meet and go beyond their client's expectations. The reliability of Luminox watches through any predicament is why they have become a gold standard of functional, dynamic and rugged timepieces.